rohingya child maybe the most vulnarable part in the world. they badly need food, shelter, education, medicine and other elementary things. i open find a drem that they will get such things..they belong from world. My dream is to travel outside my country to establish a Moroccan restaurant for my experience. I am a Moroccan cooking cook. I have a Master of Economics. I want to show my talents. My dream is not just a dream but an ambition. I want to make everyone around me happy. This is simply my dream. I feel happy when I see everyone around me happy. Skyline Sushi is not your average Sushi spot! 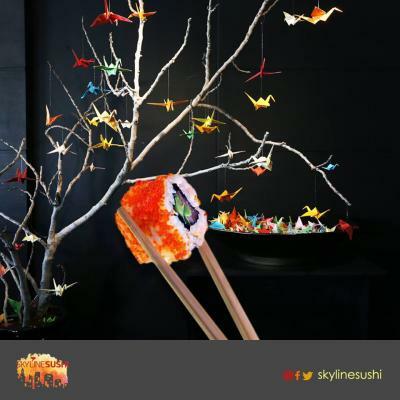 At Skyline Sushi, we offer our guests great sushi, an incredible view, along with the ability to make a dream come true! Inspired by the ancient Japanese legend of Senbazuru, which promises that anyone who folds 1000 origami cranes will be granted a wish, at Skyline Sushi, for every 100 cranes folded by our guests, we will be making a dream come true! Don't worry, we will teach you how to fold the cranes! The first dream we are currently in the works of making come true is a young woman's university tuition from the Gaza Refugee Camp! Do you know someone with a dream you would like us to grant? Submit your dream for a chance to have it come true! Submissions can (and are encouraged) to include a video entry, photographs, and a little description of the idea for the activity.